At Coney Island for the past few weeks we have been met by this long pipe snaking along the beach. Early in September the $7.2 million Army Corps of Engineer’s project to pump 600,000 cubic yards of sand along Coney Island’s shore began. Although the beach closed for the summer after Labor Day and red flags indicated no lifeguards were on duty, there were a few sunbathers and swimmers adjacent to the area where the work is getting underway. While restoration work is going on, there were rolling closures of roughly 1,000 foot wide sections of the beach where construction work is active, according to the Army Corps of Engineers (ACE). The beach nourishment project extends from West 37th Street to Brighton Beach, and is expected to be completed in the fall. 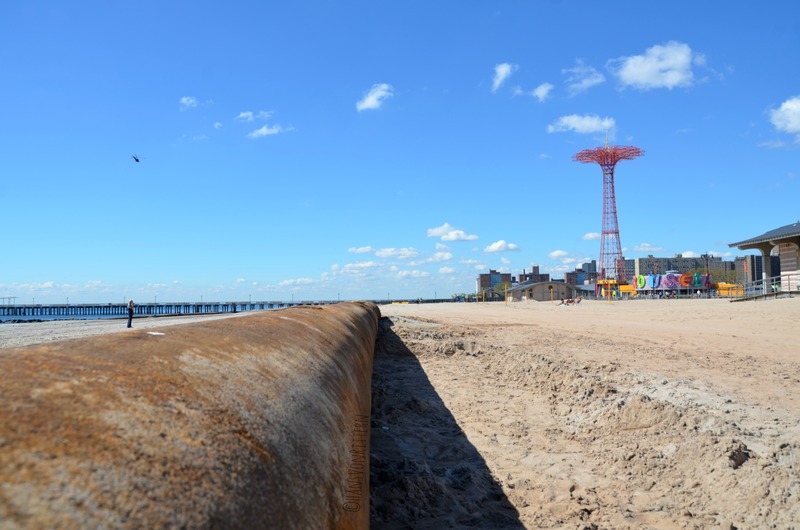 Coney Island was hit hard by Super-storm Sandy and soon, its beaches will be well on their way to being protected against future flooding. There’s a ship out on the horizon pumping the sand from the ocean’s floor (and surprising a few startled crabs I bet) and pumping it methodically onto the beach where it is sifted and raked. You can hear the rumbling of the stones and shells as they go whizzing by inside the large rusty pipes lining the beach. Soon we will be enjoying pristine sand to stick our toes into! Join us?! This entry was posted on October 26, 2013 by newyorkcityinthewitofaneye. It was filed under DAILY PHOTOS WITH STORIES OF NEW YORK CITY and was tagged with $7.2 million project to pump 600, 000 cubic yards of sand, Army Corps of Engineers, Brooklyn, Brooklyn Bridge, Brooklyn tours, Coney boardwalk, Coney Island, Fulton Ferry Landing, Hans tours, Hans Von Rittern, Harlem Spirituals, Hurricane Sandy, Nathan's original hot dog restaurant, New York, New York City, New York photo, Photo of the day, photography, pumping sand, Queens, replenishing beach sand.